Spotless family home with open floor plan on quiet street. Spacious family hub begins in family room with vaulted ceiling with fan. Natural light streams in both morning and afternoon. Create a gathering place around convenient gas fireplace with TV/art niche above the mantle. Family room opens to dining area and kitchen with microwave, stove/oven and dishwasher, ample cabinets and gleaming granite countertops. Granite extends over generous serving peninsula with breakfast bar. Great sightlines, and neutral paint throughout. Master suite features ceiling fan and private full bath. Secondary bedrooms have ceiling fans and are serviced by 2nd full bath. Tons of storage in basement. Backyard patio lets you grill in afternoon shade, plus there’s room for kids, dogs & garden. Walk/bike to 2 rec centers and parks. 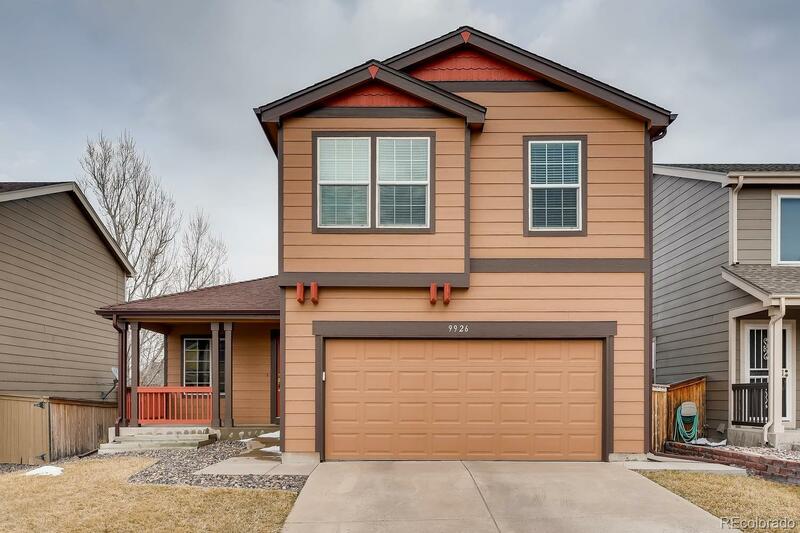 Highlands Ranch community features 4 rec centers with pools, tennis, fitness, plus miles of trails through open space with abundant wildlife. MUST SEE!